Trout Central contains 151 trout tips, more than any of my other trout fishing books. And, it lists the 50 best driftless trout streams in Wisconsin. 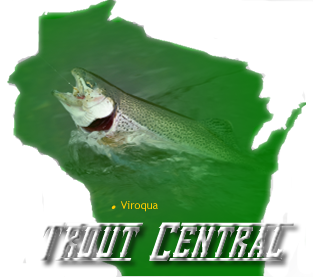 Don't fish the driftless region without Trout Central. "I really enjoyed reading Spring Creek Reward. Jay Ford Thurston is a gifted writer; and I don't know anyone who knows more about trout fishing." "Chapter 37 is titled, The Perfect Trout Day. Imagine this: It's going to be a great day. The sun is shining in a blue sky. Well, maybe that's true for wash day, but not for fishing trout. Thurston says"
"I thought I knew everything about trout streams. But thanks to that book (Spring Creek Reward) I had my best big trout day ever earlier this month (July). I caught and released more than 20 fish over 15 inches in one overcast afternoon." "I stopped to visit Thurston who live in Viroqua and writes extensively about trout fishing in Coulee Country. He was not surprised we had done well. 'I catch more big trout in July than any other month,' He told me. 'Their metabollism is highest now, so they need to consume more food than in the cooler months." 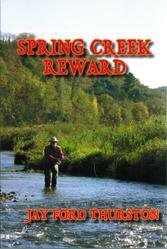 Spring Creek Reward is the third trout book by Jay Ford Thurston, and his second book devoted to fishing wild trout in spring creeks. Spring creeks are those rare and special streams rich in minerals dissolved from limestone. So where there is limestone bedrock anglers find the best trout streams in the world. After seventy one years of trout fishing any angler should have some good trout secrets to write about. However, what has enabled Jay to write with credence are the records he has been keeping since 1975. He has recorded information on the length of each trout caught over ten inches long. He also recorded time of day he caught each trout, weather conditions, water temperature, water turbidity, lure used, and where each trout was caught in the stream. In 2013, he put facts and figures together to discover July, not March and April, is the best time to catch trout over seventeen inches long in the Driftless Region of Southwestern Wisconsin. Read to find out why. He writes about where and when to fish trout in Spring Creek Reward. And they will probably wonder, as Jay often had, "Why didn't I figure that out years ago?" His research reveals the power of nature to heal the body and how fishing trout contributes to enjoying the good life. There is some duplication in the book regarding water temperature and fishing under cloud cover, but that is intentional. Those two factors are so very important, Jay presented them in more than one way so all anglers could easily remember. Spring Creek Reward has the potential to do more than help you enjoy trout fishing and catch more trout -- it could change your life forever. Spring Creek Treasure contains 150 trout tips, more than any other trout fishing book. You will read about the importance of fishing when the stream temperature is rising. It’s a treasure of information including the greatest of all fishing secrets. Regardless of how you fish trout (fly, spin, or bait) you will learn where and when to fish the stream each month of the season, from March through September. The sixty entertaining and informative stories in the first edition are the same in the second edition. 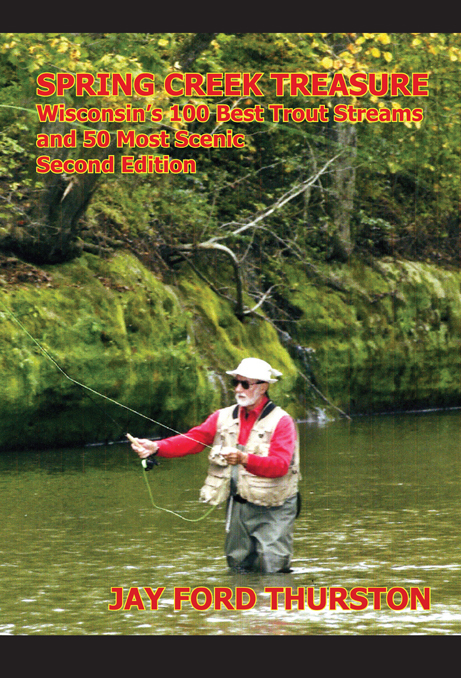 The changes in the second edition are in the 100 best trout streams and the addition of the 50 most scenic streams. As soon as the first edition was published, January, 2010, I began communicated with trout anglers throughout the state regarding the list of 100 best trout streams. I realized the trout streams in regions of sandy soil were rated too high and those in regions of limestone bedrock were rated too low. Also, I realized many anglers fished streams not just to catch trout but for the scenic beauty the stream provides. More time was needed to research and identify the 100 best streams and the 50 most scenic. In the Second Edition 19 streams were removed and replaced by 19 that rated higher. Most of the new streams came from Southwestern Wisconsin, a region of excellent soil and limestone bedrock. To assist me with research in identifying the 50 most scenic Wisconsin trout streams I sent a letter to each trout unlimited chapter in Wisconsin. Thanks to those members who helped. This title is the fundamental book on trout fishing skills with 110 trout tips about where and when to fish trout. You will learn how to wade cautiously upstream in the blind spot of the trout. Why it’s best to fish under cloud cover. The best lure presentation to use for catching trout. Good techniques of catch and release to achieve 97% trout survival. You will learn where to find big trout, and the color trout like best.